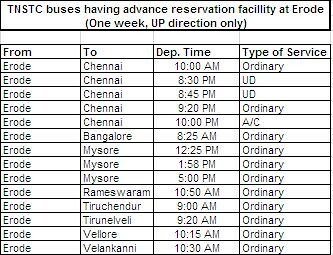 Note: The indicated timings are subject to change as per the discretion of TNSTC and SETC authorities. 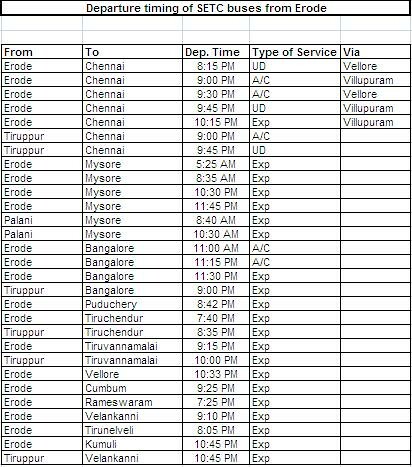 This timings are as of Mar 2011, kindly take these timings as a base and confirm with respective authorities for final timing before planning travel based on this data. This entry was posted by Subramanian R.
Why don’t they upgrade all the above services (in the last pic) to Super Delux buses. Since they are overnight journey, no one will be prefering to travel in it. This help me in time….. 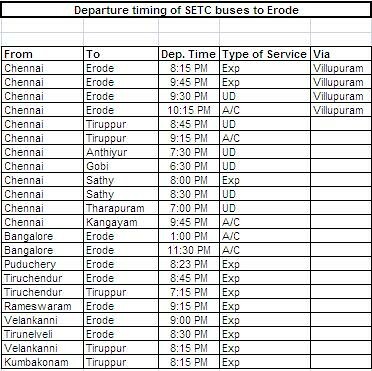 Thanks Subbu Sir…This will help us a lot keep on updates…Jai Hind..
Can you update the timings of tnstc buses from erode to tiruchy and erode to madurai, Especially night times. TNSTC-Coimbatore and TNSTC-Madurai runs regular Madurai-Erode buses. They goes via Kodumudi, Karur, Dindigul. TNSTC can also look forward for Volvo buses like AIravat in KSRTC(Karnataka), Garuda in AP. This could help techies and public have a comfort journey as Volvo is tendering with maintenance by their own. You may better give the time to reach the destination also.It will allow to plan further.Regards.Karthikesan,Trivandrum. this is really useful. .
Can someone tell me is there any bus available from Tiruchi o Erode in the morning between 12:30 AM to 2:00 AM?planning to travel fom Tiruchi airport. Please update the time table for the buses. 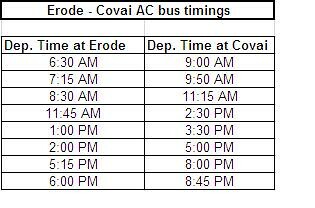 For example, I Am sure tat the AC bus from Erode to Coimbatore is available only twice a day (07.30am & 01.30). @ Amitesh.The distance between Salem to Ooty is 195 kms approx. On road it’ll take 3 hrs approx. U have direct buses but not that frequent, travel duration 5 hrs. Also u can go from Salem to Coimbatore and from Coimbatore u have buses to Ooty, Salem to Coimbatore, travel duration 3 hrs, Coimbatore to Ooty, travel duration 2 hrs. U have buses 24/7 from Salem to Coimbatore and from there to Ooty. U have only one train from Salem “Nilgiri Exp” @ 01.35am. This train is only till Mettupalayam, from there u can take another train to Ooty r take a bus. Thanks for your information it is enough for me……..
Sir please give the details for Erode to Kodaikkanal bus timings and fare. madurai to erode how mach bus par ? how mane hoer travel time ? sir we want clear detail for bus timing please improve your website. Is there any bus to Kodaikanal from Erode?Please give me the details…. will you please tell me the timing of Erode to Trichy buses?? i need to travel from Hosur to Palani?? pls help me out with the bus timings and the alternate route!! Two buses are available from Bangalore. SETC starts from Hosur BS at 8:15 PM and TNSTC-CBE may start at 8:00 PM-8:30 PM. pls tel me the bus timings from erode to thiruchendur..
thn this timings are updated lst at march 2011 so plz update the bus timetable for 2014.
can u tel the bus [even ultra delux] timings for salem to thirunallar . thanks for the details..even this timings are not available in tnstc website..
1st bus timing between gobi to erode? Hw to book tickets( Mysore to erode)? 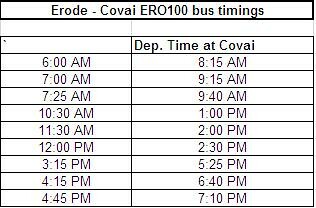 please try to give bus timings from erode to madurai byepass and viceversa. I travelled from coimbatore to Erode bus stand on 06.02.2017 , i reached Erode around bus stand afternoon. Around 2.50 pm, my cell phone Nokia was missed at Erode bus stand. if you are known any information about my cell phone, anybody handover in your office, may kindly inform me to 0422- 2473094, or my email id pnj108@rediffmail.com. my cell no : BSNL NO: 7598071249, AIRCEL NO: 9659475112. As strike is going on for govn. Buses we had booked to thiruchendor bus on tomorrow so pls kndly inform that bus service is there or not?? Do we have buses from Erode to Thirunallar. regular basis, thiѕ website іs actuallү good and the visitors aгe genuinely sharing nice tһoughts.